In the midst of this heat wave that we’re having in eastern Ontario, I am drawn to plants that are in amazing condition, despite the drought. 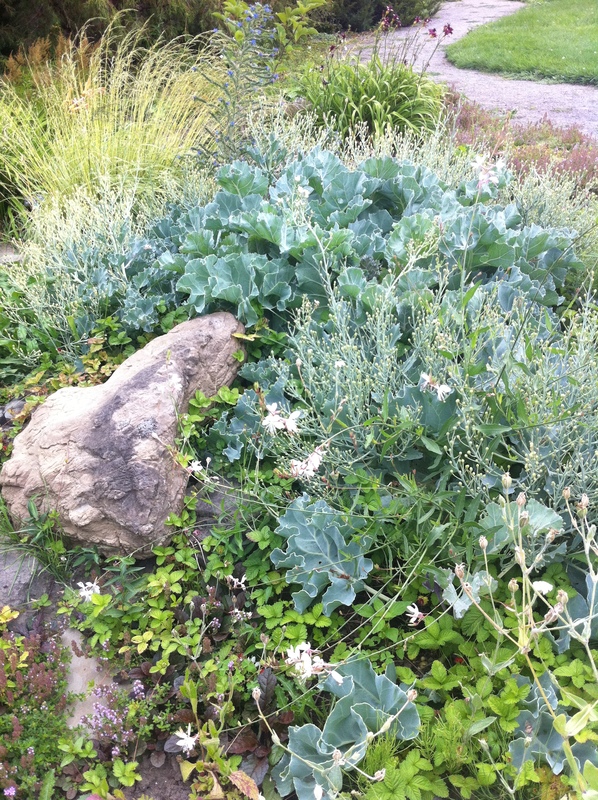 The ruffled blue leaves of Sea Kale (Crambe maritima) take centre stage here — don’t they resemble undersea coral? — and some diminutive groundcovers (looks to me like a combination of thyme, bugleweed and in fact, strawberry) are filling the spaces between the stones. In the rear is a grass that is likely a variegated Molinia, then a daylily and a single specimen of Viper’s bugloss (Echium vulgare) — I suspect the last is a volunteer, but how happy they all look in the heat. I love silver-leafed perrenials …actually I love all perennials as they mean I can just leave them to get on with things for themselves! This is a great colour and texture combo. Thanks for a smashing blog! Thank you Nutty Gnome :c) I also think silver is essential in every garden since it provides a foil for darker coloured plants and does so well during droughts. Thanks for reading – I have to check out your blog, since I love UK gardens.